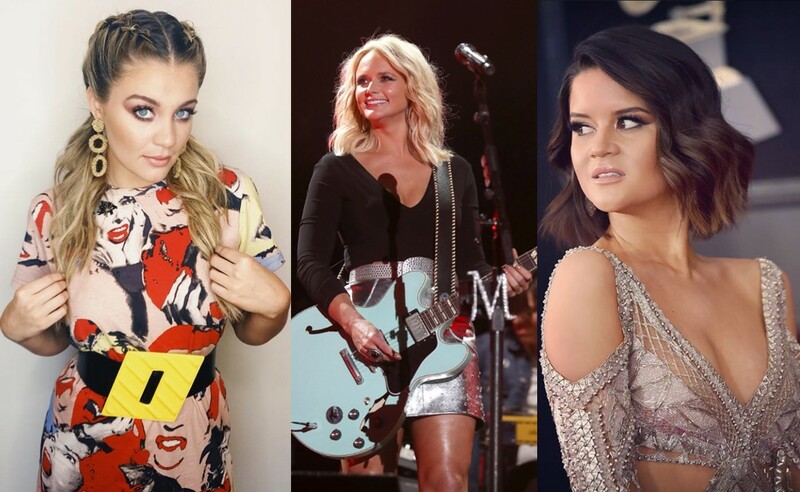 These seven country music women all have one thing in common: the same genre of music. But they differ in their personal style, setting different trends on their own. Whether it’s on stage or with their family, they show off some of the best fashion, beauty, and hair styles in the country music industry. Check out their unique looks! Maren Morris – The 5 foot 4 singer models her unique fashion sense, giving the short girls some inspiration. She rocks crop tops — just check out her Instagram where most of her posts show her killer body and love for crop tops. Also, she has fun with flashy colors, mixing and matching pieces of clothing and pulling it off flawlessly! Morris is not afraid to be daring with her outfit choices. Whether its bright stripes or strappy leather, this young country star makes her own path through the fashion world. We love her for it! Carrie Underwood – She not only follows fashionable trends… she MAKES them. Literally. Underwood has her own athletic clothing line called CALIA by Carrie, proving that women can wear sports wear and be stylish at the same time. The clothes are very practical. “I created CALIA to make it easier for me and all other women to work in working out,” Underwood says on her website. Kelsea Ballerini – We all know her from her wavy, ombre-blonde locks, but Ballerini has even more style beyond that! She likes to wear skirts, and when she does, she puts her own unique spin on it! Some days, it’s black and white stripes. Other days, it’s denim or sequin or fringe. No matter what is wears, Kelsea Ballerini shows off those flawless long legs with confidence. What will she wear next? Lauren Alaina – While she is a country music sweetheart, Lauren Alaina tends to have a punk-rock kind of style. She is bold with colors and the designs of the clothes she wears are often unique. Alaina also went through a pink phase where her hair was dyed light pink! It doesn’t get anymore rocker-girl than that. She also favors black in a lot of her outfits, but mixes it all up well enough to show off her girly personality. Mesh, stripes, black denim, and more, Lauren Alaina is definitely a fashion guru… take notes! RaeLynn – Her personal style starts with her unique stage name. “RaeLynn” is a mix of her first and middle names, with her full name being Racheal Lynn Woodward. But her hair and makeup also illustrates her sense of style. She rocks the platinum blonde bob, which Miranda Lambert once toyed with, but RaeLynn has kept it since day one! While she enjoys playing with makeup, just like any other girl, she’s not afraid to go bare. Her natural beauty is lovable. And let’s not forget about her soft spot for knee high boots! This style of hers is something she calls “Redneck Couture,” and we want to be part of it! Country but classy, RaeLynn is cute in her own way. Miranda Lambert – Her personality shows through her style choices. Lambert is a badass country girl with a big heart. Her MuttNation hats are a frequent accessory, but so is a black leather skirt or a bandana across her forehead. Top it off with her impeccable smokey-eye makeup and you’ve got the queen of country music fashion. She blends her favorite styles in the short video below and recently launched her own Idyllwind clothing line. Faith Hill – In one word, Faith Hill is elegant. In her home or on the stage, she is effortlessly flawless between her fashion and her style choices. And it seems that a dress is her strongest suit! Faith Hill sets the fashion trend of dressing up even when you don’t need to. Plus, her dresses are ALWAYS on point. Keep an eye out for Hill’s gorgeous looks because there will surely be more! One of my all time favorite dresses. Thank you, @tomford! Be sure to share these style inspirations with other country music fans!